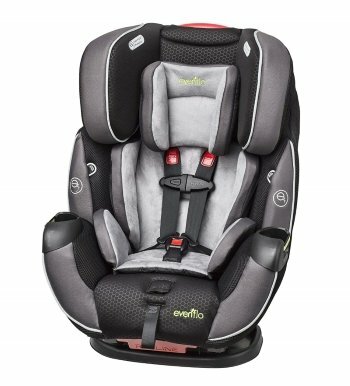 The Evenflo Symphony Convertible car seat debuted in 2008. Since then, it’s gone through a few iterations, including the current Elite model, also known as the DLX model. It comes in a few other slightly different variations exclusive to specific retailers. Here, we’ll focus on the Symphony Elite. 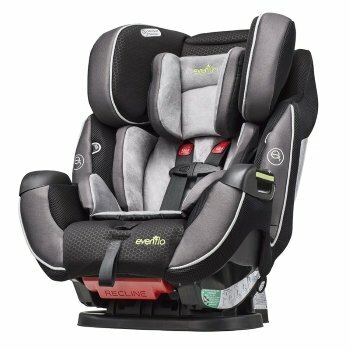 If you’re looking for a seat that will last from birth until your child no longer needs a booster seat, the Elite is one you’ll want to consider. It’s loaded with features, is about as user-friendly as a convertible seat can get, but it’s a little on the large side. So your choice may very well depend on your vehicle model and/or if you need to install alongside other car seats. You should also keep in mind that like other convertible seats, there is no portable infant carrier option, so this is an install it and leave it alone kind of seat. As far as price goes, it averages around $200, but since you may not have to replace it as you would other single-function seats, it could save you money in the long run. But is this plush all-in-one seat really the only seat you’ll need? Let’s break down the stats so you can decide for yourself. A few things to note about some features: The Ocala and Porter colors are slightly older versions and do NOT come with buckle pockets. The bottom two headrest positions are for rear-facing only. There is one recline position only for rear-facing mode and two for for forward-facing mode. The cup holders are not fully enclosed like in a lot of other car seats. They’re basically just elastic straps and will only hold rather large sippy or drink cups. So if you’re looking for something to hold chicken nuggets or a juice box or even crayons, you won’t get that here. Other versions such as the Platinum Symphony DLX with gel-matrix technology and the ProComfort Symphony DLX with Outlast performance fabric may be offered only at specific retailers. The Symphony LX is a less expensive version of the Symphony DLX (Elite), with differently shaped headwings and the regular push-on lower LATCH connectors rather than the SureLATCH self-ratcheting connectors. What are the child size limits of the Evenflo Symphony Elite All-in-One? With this seat, you get 3 modes – a rear-facing infant seat and a forward-facing seat, both with a 5-point harness, as well as a high-back belt-positioning booster seat. The 40 pound limit is generous enough to allow extended rear-facing well past the recommended 2 year old age. When your child is ready for booster mode, some parents felt that they outgrew it well before the 110 pound weight limit, so it might be best as a transitional seat to get your child used to boosters once they no longer need a 5-point harness. The seat itself is rather short, so your child will likely be too tall for it after a little while. Then, you may want to consider just a plain, inexpensive backless booster seat. In booster mode, however, the Elite is rated as a Best Bet by the IIHS, so you can trust that it’s safe. Some parents noted that the crotch buckle is not adjustable so it may not be snug enough for smaller kids, which can cause the child to wiggle down too much so that the shoulder straps are loose. Note: The top of the child’s head must be at least 1 inch below the top of the headrest in any of the headrest’s three lowest positions. How big is the Evenflo Symphony Elite All-in-One and will it fit in your vehicle? This is a tricky one. Convertible (especially 3-in-one models) are notoriously bulky. This one’s no exception. The weight will help in keeping the car seat from wobbling side to side. However, the width will likely not allow for 3 car seats side-by-side unless you have a really large backseat. Several parents had no issues fitting it in small and mid-sized cars. The required recline angle for rear-facing makes the seat really long from front to back, which means your front passenger may lose some leg room. If in doubt about whether it will fit in your car, try calling Evenflo customer service at 1-800-233-5921. How safe is the Evenflo Symphony Elite All-in-One? The good thing is that this seat has performed well in real-life crashes. So we know the seat can do what it’s supposed to do. That is, if it is a good fit for both your child and your vehicle. Real life crash experiences: The seat protected a 13-month old in a direct side impact on the child’s side of the car. The vehicle was a 2010 mid-size SUV. The seat also protected a toddler in a multi-car crash that totaled a Ford Excursion. 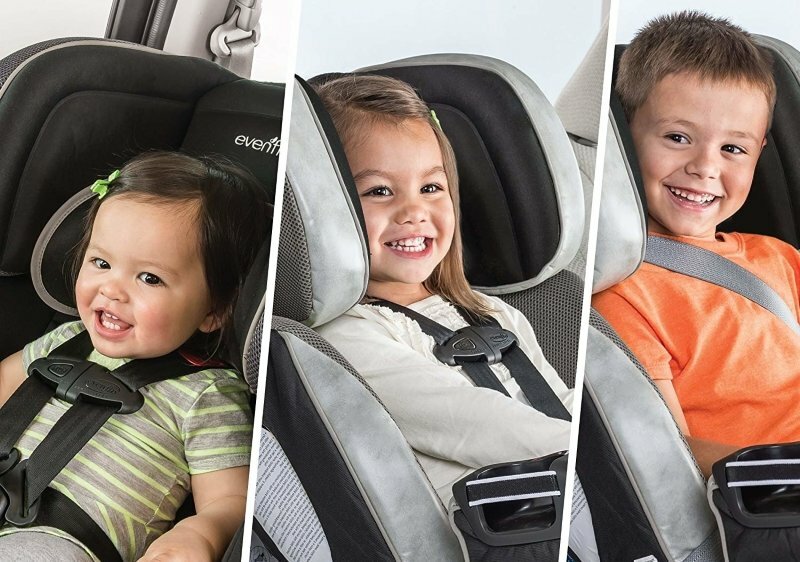 The main complaint by far was that the rear-facing mode only has one recline position, which can leave an infant’s head slumping too far forward. Again, this will largely depend on the angle of your vehicle’s backseat, which can vary widely by car model. But a good solution many parents tried was using a pool noodle under the bottom to achieve the proper angle for rear-facing. Believe it or not, this is also suggested in the user manual. If you try this and have any doubts, you can always take it to your local car seat technician or fire department to see if it’s secure enough. Other issues involved the side wings on the headrests, which some parents felt were too flimsy. A few noted that the foam inside actually broke so that the wing hung loose. A few parents reported frayed tightening straps. How easy is the Evenflo Symphony Elite All-in-One to install and use? It depends on who you ask. Most customers reported an easy installation and liked the SureLATCH self-ratcheting straps much better than the regular push-on lower LATCH connectors. The biggest issue here seems to be the length of the LATCH straps. The SureLATCH isn’t a sure thing for all vehicles. Several people reported that they just could not attach the straps to the lower anchors because they were too short to reach. However, we noticed there are two sets of LATCH systems – one for forward facing and one for rear-facing. Make sure you’re using the correct one. This may or may not have been the case with those reports. But it is one thing to look for if you find that the LATCH straps seem too short. In any case, installation with the vehicle belt works just fine if you can’t use the LATCH. The belt paths are easy to find and simple to use. Unlike a lot of other seats, there is no real level indicator for rear-facing installation. There is a line/arrow on the side of the base. You need to install it so that that line is level to the ground, which is a little disappointing considering the rest of the features on this seat. 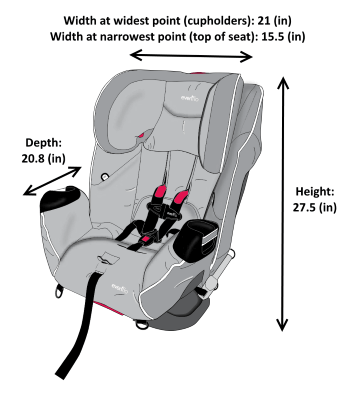 As with all convertible car seats, there is no carry handle, so there is no portable infant carrier option. Elastic cup holders may not hold small cups well & won’t hold loose snacks, crayons, etc. As far as convertible seats go, the Evenflo Symphony Elite is a good option if you’re looking for a seat that will last at least until it’s time for a booster. You’ll want to pay special attention to your child’s height to see if they’re outgrowing the booster because they’ll likely outgrow it before they reach the 110 pound weight limit. As far as the recline issues in rear-facing mode, if you’re okay with using a pool noodle or towel to adjust the angle, this seat should perform just fine like that. Again, if in doubt, consult your pediatrician, your fire department or car seat technician. Or simply choose another seat. The seat will probably fit fine unless you need to fit more than two car seats or a third older passenger in the back seat. Your front passengers may lose some leg room due to the space requirements of the rear-facing mode. As far as comfort goes, it would be hard to beat this seat. The padding and fabric are top notch. Installation should also be very easy with the SureLATCH connectors and the easy-to-see belt path for seat belt installations. If you find the LATCH straps too short, make sure you’re using the correct set. There should be one for forward facing and one for rear-facing mode. Since the price isn’t outrageous, we feel confident that you’ll get your moneys’ worth in a safe, long-lasting seat with this model.